Chatbots are much-discussed in many industries right now. The technologies behind chatbots have grown in power in recent years, unlocking many new opportunities for chatbot use. Insurers have been experimenting with chatbots for over 10 years. Today, insurance chatbots are deployed by traditional insurers and insurtech firms for internal and external uses across many different platforms. A chatbot is a digital service that can conduct natural-sounding conversations with human beings to accomplish tasks like answering questions. A virtual assistant is a chatbot with the ability to help users make transactions. Both usually function within dedicated messaging apps like WhatsApp or Facebook Messenger. These messaging apps have skyrocketed in popularity in the last four years. According to Business Insider, the four most popular messenger apps have a larger combined user base of over 3.5 billion, surpassing the combined user base of the four biggest social networks. Facebook Messenger alone has over one billion monthly users. 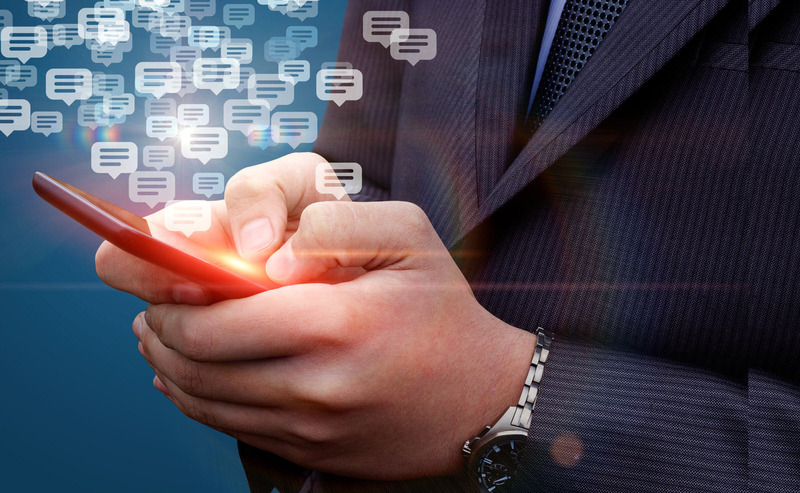 Late last year, a survey of 6,000 consumers around the world found that nine out of ten consumers would like to be able to use messenger apps to talk to businesses. It also found that messaging is the favorite service channel for consumers in the US, India, South Korea and Singapore, and among the top three preferred channels worldwide. The consumer shift towards these platforms presents a huge opportunity for businesses. Seizing that opportunity will require the use of chatbots. 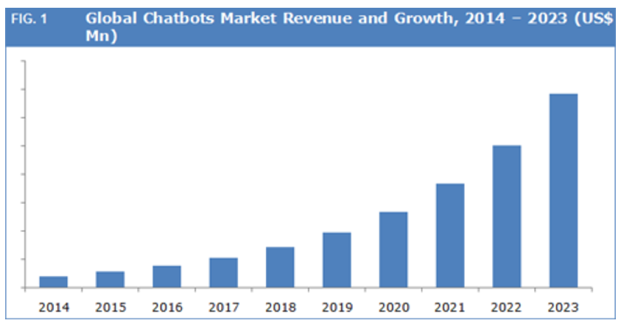 Analysis from Credence Research projects that the chatbot market is on the verge of exponential growth. “Marc,” launched in 2007, answered questions about the French financial services firm Credit Agricole’s health insurance service. The bot could also analyze customer needs and modify product offerings to meet them. “Nienke” is the “virtual host” of Nationale-Nederlanden, one of the leading insurers in Holland. First deployed in 2011, Nienke answers user questions and provides links with answers to other common questions based on the original query. “Magda” is a chatbot deployed by the Polish insurer Link4 in 2012. “Mia” is a chatbot that provides banking and insurance information and advice to employees at the Co-operative Banking Group in the UK. Mia lives on the firm’s intranet. Employees can interact with her using natural language. She responds with human-like language herself and answers questions directly, with intranet and web links, or with questions for clarification. She can also update back-end systems. Allstate’s “ABIe” was launched in 2015. The large American P&C insurer developed ABIe to help its agents learn to sell commercial insurance products for the first time. (The name is short for “Allstate business insurance expert.”) ABIe walks agents through the commercial selling process and can retrieve documents. It understands what product an agent is working on, where they are in the process, and who they are. It handles more than 25,000 inquiries per month. Liberty Mutual Insurance’s “skills” for Alexa were launched in 2016. A skill is an app on Amazon’s Echo voice-controlled smart speaker, which connects to the Alexa AI platform. Liberty’s two skills answer user questions, provide auto insurance estimates, and connect users with insurance agents. They also provide advice on managing risk. GEICO’s “Kate” was launched in early 2017. Kate is a smartphone app who can converse with users through text or voice recognition. She can answer customer questions about balances and payment dates and retrieve documents. HDFC Life’s collaboration with Haptik was launched in March 2017. The Indian life insurer ran a two-week trial earlier this year with its mobile chatbot platform, which guided users through a short quiz to calculate their insurance needs. These examples illustrate the growing geographic and functional diversity of chatbots. Though many are consumer-facing, some focus on business processes to speed up administrative tasks. Many of these examples are essentially information retrieval tools. Some automated assistants can do much more. Come back next week for a look at virtual assistants and their growing role in the insurance industry. In the meantime, more Accenture insight about the global impact of chatbots can be found here. Great post Eric. Chat bots are finding their place in almost every business sector. One of the crucial reasons for their growing importance is the need for customer support services 24/7. Chat bots offer good ROI, being a onetime investment.